Members of one of Sheffield’s newest churches dug deep to contribute £350,000 to the cost of buying a permanent home … a former Edwardian church. 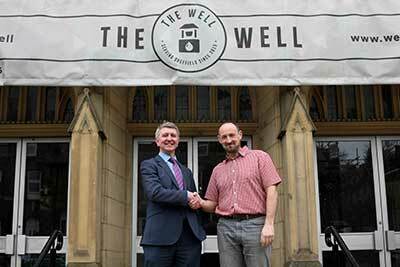 Thanks to their generosity, The Well Sheffield now owns the former Endcliffe Methodist Church on Ecclesall Road lock, stock and spire. A praise party was held to celebrate earlier this month, after its city commercial lawyers Ironmonger Curtis completed on the £785,000 deal. The church went on the market in summer 2016 and The Well, which is led by Baptist minister Rev Nick Allan and his wife Marjorie, proved the highest bidder. “There were several keen bidders, including developers wanting to turn it into retail use and apartments,” said Rev Allan, whose church had been renting the space since its inception in September 2015 after the previous Methodist church closed down earlier that year. “We believed the building, in one of Sheffield’s busiest residential and entertainment districts, was the perfect place for us to create a contemporary church and wanted to make the house (of God) our home. During the bidding process The Well had successfully applied to have the building, built in 1904 at a cost of £6,500 to seat a congregation of 800, earmarked as an asset of community value by Sheffield City Council. The move which was backed by locals, including Sharrowvale Community Association. “It was very heartening that people wanted it to remain a church and that the Council felt it was an asset to the community,” said Rev Allan, who with his wife has more than 16 years of Christian ministry experience and previously led two other Sheffield churches.